Lisbon is the capital city of Portugal. a lively and multicultural place. Pre World War I wooden trams clank up steep gradients, past mosaic pavements and Art Nouveau cafés, and the medieval, village-like quarter of Alfama hangs below the city's castle. Modern Lisbon has kept an easy-going pace and boasts a vibrant, cosmopolitan identity from large communities of Africans and Asians. In 1994, Lisbon was European City of Culture, while in 1998 the city hosted the last great Expo of the millennium. There are few monuments and little art in Lisbon, largely due to the 1755 earthquake. There is one building from Portugal's golden age – the Mosteiro dos Jerónimos at Belém – that is the equal of any monument in the country. More modern developments include the Fundação Calouste Gulbenkian museum complex and the Tómas Taveira's amazing postmodernist shopping centre at Amoreiras. Port Location – Ships dock at the port of Lisbon close to the downtown area and about 9 km's from the old section of Lisbon. The ship is also quite close to the Lisbon International airport (about 15 euro by taxi) for those either embarking or debarking in Lisbon. Transport Links - Foreign and domestic flights land at Lisbon's Aeroporto de Lisboa about 6.5km from the heart of the city. Most international rail passengers from Madrid and Paris arrive at the Estação da Santa Apolónia, Avenida Infante Dom Henrique, the major terminal. International motorists must arrive through Spain, the only nation connected to Portugal by road. Buses from all over Portugal, including the Algarve, arrive at the Rodoviária da Arco do Cego. Public transportation is inexpensive but inadequate at times. Most of the city can be covered on foot. 5 Night Cruise sailing from Lisbon to Malaga aboard Royal Clipper. 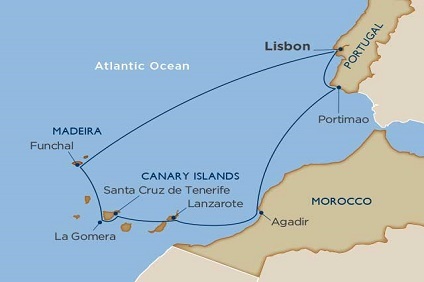 7 Night Cruise sailing from Porto roundtrip aboard Viking Hemming. 2 night hotel stay pre-cruise in Lisbon.